RaySphere is the ideal solar analysis system for absolute irradiance measurements from 300-1700 nm. Specifically designed with the qualification of solar flashers, simulators, and filters in mind, RaySphere is small, portable, easy-to-use, and exceeds the requirements for measurement accuracy, repeatability, and wavelength range needed to classify simulators per applicable iec, JiS, and aStm standards. 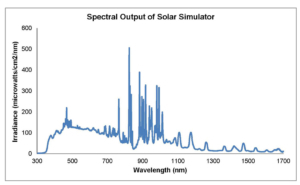 UV-Vis and NIR spectroscopy are useful for validating the spectral output of solar simulators.